Chocolate, Chocolate, Chocolate! 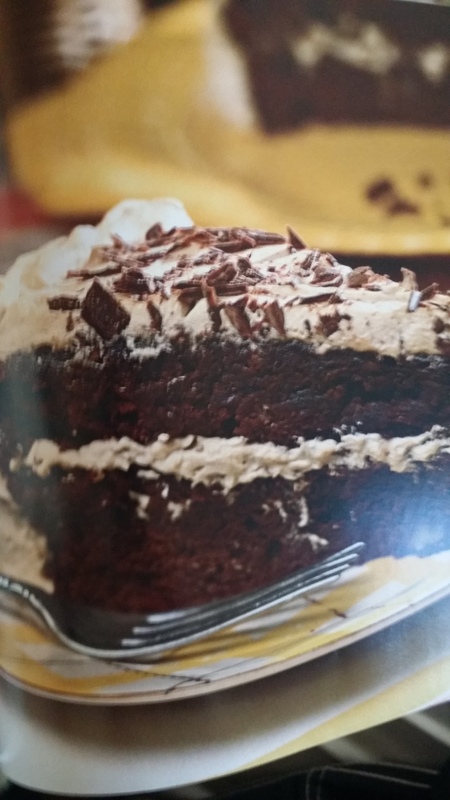 What a great month to try all new chocolate desserts Finding the Southern Living Chocolate Dessert cookbook, well,what better place to look for all new recipes. Coat 2 ( 8″) round cake pans with cooking spray. Line pans with wax paper and coat with the cooking spray. Combine brownie mix and next 3 ingredients in a large bowl. Stir in pecans (Hum…I might be tempted to add about 1/2 cup chocolate chips). Spread batter evenly into prepared pans; bake for almost 23-25 min or until they test done. Remove from oven and place on wire racks to cool completely. Combine whipping cream and coffee granules. Beat at medium speed with mixer until starting to hold shape. Gradually add the powdered sugar and continue to beat until stiff peaks form. Spread whipped cream mixture on top of one brownie layer that you have placed on a serving platter. Top with remaining brownie layer and spread the rest of the whipped cream mixture over the top and sides of the brownie cakes. Store in fridge and garnish as desired. Love, love the pictures….now I know what it’s to look like….yummy….for my tummy…..lol…. It does look delish…can’t wait to make it.